I posted before on a remarkable quotation from the Treatise of Human Nature. The quote captures beautifully one of the core areas of behavioural economics, namely present bias and the role of various mechanisms to promote future oriented and otherwise productive decision-making. "In reflecting on any action, which I am to perform a twelve-month hence, I always resolve to prefer the greater good, whether at that time it will be more contiguous or remote; nor does any difference in that particular make a difference in my present intentions and resolutions. My distance from the final determination makes all those minute differences vanish, nor am I affected by any thing, but the general and more discernible qualities of good and evil. But on my nearer approach, those circumstances, which I at first over-looked, begin to appear, and have an influence on my conduct and affections. A new inclination to the present good springs up, and makes it difficult for me to adhere inflexibly to my first purpose and resolution. This natural infirmity I may very much regret, and I may endeavour, by all possible means, to free my self from it. I may have recourse to study and reflection within myself; to the advice of friends; to frequent meditation, and repeated resolution: And having experienced how ineffectual all these are, I may embrace with pleasure any other expedient, by which I may impose a restraint upon myself, and guard against this weakness." As I noted in the previous post, the Scottish Enlightenment is a historical antecedent to the development of a wide range of modern thought. Ashraf, Camerer and Loewenstein's "Adam Smith, Behavioral Economist" provides an account of the ideas of one of the era's main figures. 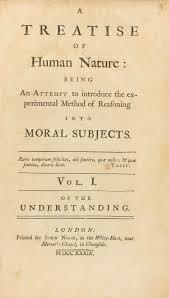 As well as Smith, over the years I have become increasingly struck by how much of the philosophical essence of the modern behavioural turn in economics is captured in Hume's Treatise of Human Nature. The Treatise is divided into three books: "Of the Understanding", "Of the Passions", and "Of Morals". The final sentence of the introduction already gives a sense of the grounded empiricism that characterises his approach and has such an affinity with current emerging literatures. "We must therefore glean up our experiments in this science from a cautious observation of human life, and take them as they appear in the common course of the world, by men's behaviour in company, in affairs, and in their pleasures. Where experiments of this kind are judiciously collected and compared, we may hope to establish on them a science which will not be inferior in certainty, and will be much superior in utility to any other of human comprehension." Book 1 examines how people make sense of the world and establish causal connections and other relationships. It is one of the founding documents of modern cognitive science and, by implication, the type of behavioural economics work that grew from the cognitive revolution. The difficulty in establishing causal ordering in the world and the necessity for humans to attempt to do this based on their limited experiences is of course at the essence of behavioural accounts of how people make economic decisions. Furthermore, the extent to which decisions are influenced by the interplay of reasoning and emotions is core to the Treatise, with the second book dealing in detail with the role of "passions" in human decision making. 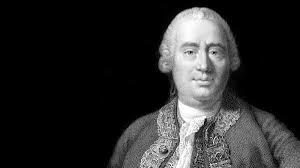 As with Smith's "Theory of Moral Sentiments", Hume deals with a variety of human emotions and their effects. The call by Jon Elster to bring emotions back into the heart of the study of human decision making finds a philosophical home in this book. To some extent the relation of Hume to modern behavioural economics and behavioural science could be seen as coming through the implications he had for the psychological literatures that emerged from philosophy in the 20th century. For example, to the extent that Hume's work is the philosophical antecedent to cognition research, then he obviously affected behavioural work through this. But I think, the third book of the Treatise, from where I found the original quote shown above, has a more direct link. In this book, Hume moves from describing human nature to discussions of what we should do. In particular, he examines the role of government, law and institutions in pushing people toward the common and longer-term good. The style of reasoning is almost directly related to modern behavioural theories of commitment devices and related mechanisms of policy. Section VIII "Of the origin of government" shows this most closely. As well as the quote above that motivated this post, see also below (and apologies for the length). The passage below directly precedes the first quote above. It is a remarkable argument for the limits of individual decision making and the importance of wider deliberative action to promote both common interests and long-term welfare. In total, the interplay in Hume of reason and emotions in influencing decisions, the problems of limited understanding of the world, our tendency toward short-termism, and the role of institutions as co-ordinating mechanisms, as well as his belief in the importance of grounded empiricism, makes his work in my view the most cogent philosophical antecedent to current behavioural economics and behavioural science and policy work. This was my motivation for using "Back to Hume" as the title of a recent lecture. "Nothing is more certain, than that men are, in a great measure, governed by interest, and that even when they extend their concern beyond themselves, it is not to any great distance; nor is it usual for them, in common life, to look farther than their nearest friends and acquaintance. It is no less certain, that it is impossible for men to consult, their interest in so effectual a manner, as by an universal and inflexible observance of the rules of justice, by which alone they can preserve society, and keep themselves from falling into that wretched and savage condition, which is commonly represented as the state of nature. And as this interest, which all men have in the upholding of society, and the observation of the rules of justice, is great, so is it palpable and evident, even to the most rude and uncultivated of human race; and it is almost impossible for any one, who has had experience of society, to be mistaken in this particular. Since, therefore, men are so sincerely attached to their interest, and their interest is so much concerned in the observance of justice, and this interest is so certain and avowed; it may be asked, how any disorder can ever arise in society, and what principle there is in human nature so powerful as to overcome so strong a passion, or so violent as to obscure so clear a knowledge? It has been observed, in treating of the passions, that men are mightily governed by the imagination, and proportion their affections more to the light, under which any object appears to them, than to its real and intrinsic value. What strikes upon them with a strong and lively idea commonly prevails above what lies in a more obscure light; and it must be a great superiority of value, that is able to compensate this advantage. Now as every thing, that is contiguous to us, either in space or time, strikes upon us with such an idea, it has a proportional effect on the will and passions, and commonly operates with more force than any object, that lies in a more distant and obscure light. Though we may be fully convinced, that the latter object excels the former, we are not able to regulate our actions by this judgment; but yield to the sollicitations of our passions, which always plead in favour of whatever is near and contiguous. This is the reason why men so often act in contradiction to their known interest; and in particular why they prefer any trivial advantage, that is present, to the maintenance of order in society, which so much depends on the observance of justice. The consequences of every breach of equity seem to lie very remote, and are not able to counter-ballance any immediate advantage, that may be reaped from it. They are, however, never the less real for being remote; and as all men are, in some degree, subject to the same weakness, it necessarily happens, that the violations of equity must become very frequent in society, and the commerce of men, by that means, be rendered very dangerous and uncertain. You have the same propension, that I have, in favour of what is contiguous above what is remote. You are, therefore, naturally carried to commit acts of injustice as well as me. Your example both pushes me forward in this way by imitation, and also affords me a new reason for any breach of equity, by shewing me, that I should be the cully of my integrity, if I alone should impose on myself a severe restraint amidst the licentiousness of others. This quality, therefore, of human nature, not only is very dangerous to society, but also seems, on a cursory view, to be incapable of any remedy. The remedy can only come from the consent of men; and if men be incapable of themselves to prefer remote to contiguous, they will never consent to any thing, which would oblige them to such a choice, and contradict, in so sensible a manner, their natural principles and propensities. Whoever chuses the means, chuses also the end; and if it be impossible for us to prefer what is remote, it is equally impossible for us to submit to any necessity, which would oblige us to such a method of acting. But here it is observable, that this infirmity of human nature becomes a remedy to itself, and that we provide against our negligence about remote objects, merely because we are naturally inclined to that negligence. When we consider any objects at a distance, all their minute distinctions vanish, and we always give the preference to whatever is in itself preferable, without considering its situation and circumstances. This gives rise to what in an improper sense we call reason, which is a principle, that is often contradictory to those propensities that display themselves upon the approach of the object."